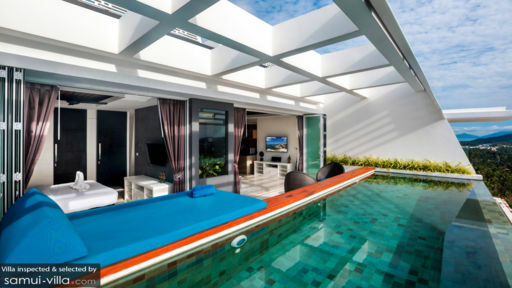 A newly-developed property in Koh Samui, Aqua Samui is a boutique property which offer 3-bedroom and 2-bedroom private villas to guests traveling to Thailand to explore its many beaches and attractions. 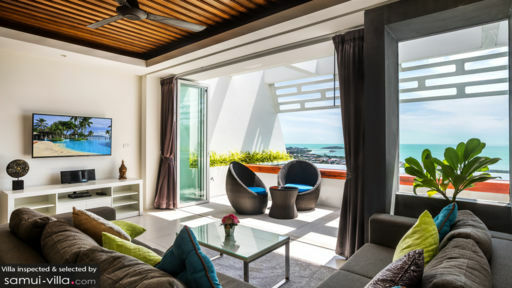 Overlooking the popular Chaweng district as well as the famous Gulf of Siam, the villas are perfectly designed to offer panoramic sea vistas from the terrace and bedrooms. A 3-bedroom standard villa offers its guests a luxurious stay in the most comfortably-designed and conveniently located holiday home which sports a private pool and terrace! The three stunning, contemporary bedrooms at the property are a sight to behold with their sleek interiors, and floor-to-ceiling glass walls that will leave you breathless once you witness the gorgeous view outdoors. With double beds, flat-screen TV, and air-conditioning, the bedrooms are perfect vacation spots in themselves where you can chill all day simply lying on your bed and enjoying the peaceful atmosphere with nothing to disturb your slumber. These bedrooms are accompanied by en-suite bathrooms which are equally luxurious fitted with excellent amenities and shower areas for guests. Since the property aims to provide a holistic and personal experience to each of its guests, ever villa on the property boasts of its own private swimming pool. Take a refreshing dip in the cool water, or lounge on the sun chairs while gazing at the gorgeous scenery, as you bask under the tropical sun, feeling grateful for this beautiful time! All your worries will soon seep away as you sip on your pina colada and lather yourself with some SPF! The fresh island breeze is about to do some wonderful things to your mood as well. The gorgeous, open-plan living area at the standard villa has glass doors that can be folded open to the private terrace, which is again furnished with rattan chairs for a calming sitting space. The living area is furnished with well-cushioned, plush sofas, and recliner chairs that you can snuggle up in, as you watch some movies on the large, flat-screen TV. The refreshing breeze floods the room and so does the sunlight, illuminating each and every corner into a bright and cheerful space. The dining area inside the living room is furnished with a six-seater dining table for guests, so that everyone can enjoy a meal together, as they relish the splendid view outdoors. A modern kitchen is equipped with the best of amenities and appliances, featuring state-of-the-art technology for a convenient and comfortable culinary experience. The property itself is absolutely divine with a beautiful lobby/reception area complete with walkways that feature serene ponds and other spots that offer a beautiful view of the sea. 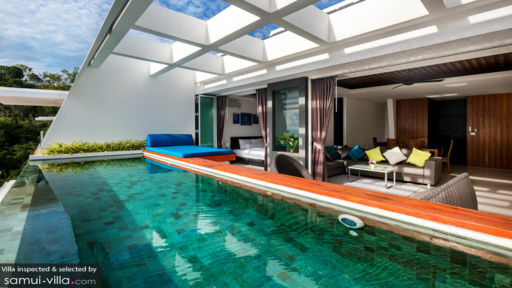 Services being offered to guests of the villas include a lavish spa list with many Thai massages and treatments! A gym/health club and a restaurant/ bar are expected for the second half of 2018. There is so much to do in Koh Samui, you will be spoilt for choice. There are adventure sports like kitesurfing, kayaking, deep-sea diving, or water activities like snorkeling, swimming, etc. You could traverse through national parks for hikes, or explore marine life on the beach. Dolphin and whale watching are fun activities to engage in with friends and family. For an evening out, Chaweng and Lamai beach are replete with nightclubs, restaurants and beach bars!